Two men have been arrested after an attack at a pub in Wakefield city centre. Police said the serious assault took place at Moodies pub on Westgate at around 10.45pm on February 20. The scene at Moodies yesterday. It has left a 52-year-old man in a critical but stable condition in hospital. Wakefield CID have arrested two men on suspicion of GBH with intent, following the incident. 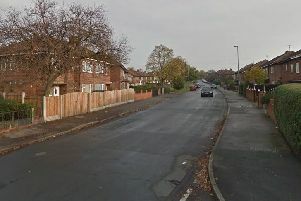 A police spokesman said: "A 29-year-old Wakefield man was arrested last night on suspicion of wounding with intent in connection with the assault and a 31-year-old Leeds man was arrested on suspicion of GBH with intent." Detectives are appealing for witness as they continue their investigations. Detective Inspector Dave Rogerson of Wakefield CID, said: "We have arrested two men in connection with this incident but still very much continue to appeal for witnesses. "I would like to speak to anyone who may not have come forward who was in the pub at the time and saw what happened. "Anyone who has information is asked to contact Wakfield CID on 101 or the independent Crimestoppers charity on 0800 555 111."